The first part deals with the food history of Iceland from the Settlement through the Middle Ages and up until the late 18th – early 19th century. The second part covers the history of Icelandic cooking from the beginning of the 19th century until today. The material is mostly taken from the new and revised edition of my book Icelandic Food and Cookery, published by Forlagið (www.forlagid.is) in Iceland. The original edition was published by Hippocrene Books, New York, NY, in 2002. Those interested in further reading might perhaps like to look at a paper I gave at the Oxford Food Symposium in 2016, called Gone and Forgotten: Hook steaks, trash bag,s and other vanished Icelandic offal dishes, available in the Proceedings of the Symposium. Some years ago, I was searching online for books on the Central Asian countries, Tadzhikistan, Kirghistan, Kazakhstan – and I came across a book title that intrigued me. I can’t recall the author but the title was “Somewhere East of Life”. I have no idea what the book is about but somehow I felt I didn’t need to read it – the title said it all. East of life, east of hope, east of civilization … it was all there. It wasn’t until much later that it occurred to me that until maybe a hundred years ago, most people would have considered a variation on this title quite fitting to Iceland, which was always somewhere north of life. So the cooking I’m about to describe can’t be said to be mainstream medieval European cooking. It is the cooking of people that chose to live at the outskirts of the habitable world, where resources were few and limited, and had to adapt their diet, their cooking methods and their daily life to that fact. What Did the Settlers Eat? Most of what can be said about the diet of the people who came to Iceland in the Settlement period (AD 874-930) is guesswork. There are no written documents dating from that period, no cookbooks, no traveller’s descriptions, no trade accounts. What we have is the evidence of the Sagas, written centuries later and not really all that concerned with culinary matters, and some scant archaeological evidence. Icelanders, and I suppose everybody else as well, have always assumed that the great majority of the people who settled Iceland came directly from Norway and other Scandinavian countries and carried with them almost pure Norse customs and culture. The Sagas certainly support this, even though they mention Celtic slaves and even a few settlers who came from the Hebrides and Scotland. Very few Celtic words have found their way into the Icelandic language; few given names or placenames are of Celtic origin; and there is not much in Icelandic culture or customs to suggest a Celtic heritage. A few years ago new genetic research by Icelandic scientists revealed some startling results: Even though 80% of the males who settled Iceland did indeed come from Scandinavia, the genetic evidence shows that well over half the women (63%) actually came from the British Isles, probably mostly from Ireland, Scotland and the Hebrides. The scientists can of course not tell us why this is the case. Did many of the migrating Vikings actually settle temporarily in the British Isles and marry local women? Or did settlers on their way to the remote island in the west – having failed to persuade the women back home to throw caution to the wind and emigrate with them – simply raid Celtic villages and farms on their way to their new home, taking the women as slaves? It is almost certain that both things happened to some extent. What did not happen, however, is the Celtic influence on Icelandic cooking that one might expect, as cooking was definitely a woman’s job in Viking culture. The clearest evidence of Celtic influence on Icelandic cooking is probably the use of dulse, which seems to have begun during the Settlement period in some regions at least. Dulse was much eaten in Ireland but almost unknown as a food in Norway. This is not to say that the first generations of Icelanders ate exactly the same food as their ancestors had done in Norway. The settlers will have needed to make some changes to their diet as soon as they came to Iceland. They had found a virgin country, with rivers full of salmon and trout, with seals and birds previously unexposed to man. Furthermore, eggs of wild fowl could also be gathered, meaning that in the early days of the Settlement there was plenty of food available for the taking, in addition to the animals brought over by the settlers, and the crops they cultivated on arrival. The settlers soon discovered the importance of good pastures for their livestock, as well as fields for hay-making. The winters in Iceland are long, longer than many of the settlers would have been used to, and quite a lot of hay was usually needed to feed the breeding stock through the winter. So What Was Available to Them? No recipes survive from the Viking era, if any such were indeed ever written, and few clear descriptions of food preparation and cooking. But we do know something of the utensils that were used and the ingredients that were available. It is more or less known what animals, wild and tame, there were in Scandinavia and the British Isles during Viking times, and to a degree we also know what wild and cultivated plants there were to choose from. In most of these countries, grains could be grown fairly easily and formed a great part of the winter food supply. The old sources usually mention just “korn” (grain), without specifying the type, but the grain types the settlers would have known were barley, rye, wheat, and in some cases maybe oats and buckwheat as well. Now of course these were not the high-yielding grains of today, but more primitive types with less kernel and more straw. So the yield, which probably wasn’t very high in the countries the settlers came from, would have been even more meagre in the harsh Icelandic climate. Nevertheless, grain had probably been a mainstay of the diet of these people, especially those who came from Southern Norway, Denmark and the British Isles. While old sources usually just mention “korn” (grains), without specifying the type, we know that the grain types which were familiar to the settlers were barley, rye, wheat, and in some cases oats and buckwheat as well. Now of course these were not the high-yielding grains of today, but more primitive types with fewer kernels and more straw, meaning that the yield, which probably wasn’t very high in the countries the settlers came from, would have been even more meager in the harsh Icelandic climate. Nevertheless, it is most likely that grains were a mainstay of the diet of these people, especially those who came from southern Norway, Denmark, and the British Isles. Many of the settlers will have been used to several types of fruit ,nuts in their homelands: Plums, cherries, small apples, pears, several types of wild berries, walnuts, hazelnuts, beechnuts, acorns, and others. They had to learn to live without these in their new home in Iceland. No fruit-bearing trees grew there; no edible nuts, almonds or acorns were to be found; and there were only a few types of wild berries. In Scandinavia, quite a few crops were grown besides barley and rye in Viking times. Kale and turnips were probably the most common vegetables, and herbs such as dill, coriander, and probably cress, were also grown and used for herbal remedies, in drinks and as seasoning for food. Additionally peas and beans, along with various onions, parsnips, and carrots were also grown, but to a lesser extent. It can be safely assumed that many of the original settlers in Iceland had experience not only in raising livestock, but also in growing grains and some types of vegetables. It is also highly likely that they had expected to be able to carry on with this in their new home, but this proved difficult and in many cases impossible. The climate was unfavorable and supplies such as seeds were difficult to acquire. Despite this, the early Icelanders were reluctant to change, to the point of stubbornness. Maybe this is one of the reasons for the strange fact that despite Icelanders living in close proximity to some of the richest fishing grounds in the world, and even though farming in Iceland is a challenging battle with the elements at the best of times, they stuck to being a pastoral society for a thousand years, until they eventually faced facts and became a nation of fishermen. So what did they experiment with and what was successful? We do have an idea about what was grown at the bishop’s seat at Skálholt, established in the 11th century. A study on pollen from a moor at Skálholt was done in 1960 by Þorleifur Einarsson. He collected core soil samples from the moor and identified and counted the pollen found in them. As it happens, it is actually easier to date such soil samples in Iceland than in most other places, as the frequent volcanic eruptions divide the soil into layers and you only have to look at where the object you want to date is found. If pollen of a particular plant is found just below a ash layer that can be identified as dating from the Mt. Hekla eruption of 1104, for instance, we would know that this plant had been growing in Skálholt before that time. One very identifiable layer has been called “the Settlement layer”, as it fell in an eruption during the settlement period, probably in AD 898. It is found all over Iceland and has proved very useful in dating many archaeological and geological findings. Þorleifur Einarsson’s study revealed many interesting things regarding the vegetation at Skálholt, as well as the environmental effects of the Settlement and climatic changes. For instance, barley becomes evident in the period when the land was settled and at the same time, there is evidence of a marked decrease in birch and willow. Several species of grass, and some weeds such as chickweed, show a marked expansion. Wormwood appears in the Skálholt samples from the 10th century but disappears in the late 18th century and is non-existent in the wild in present-day Iceland. It was probably grown in the herb garden at the bishop’s seat, as a medical herb and perhaps to flavor ale as well. It was also used in the making of ink, as the taste of wormwood prevented mice from gnawing the manuscripts. Yarrow may also have been used to flavor locally brewed ale. In the low-lying regions of Iceland, barley could be grown after land had been cleared but the growing season was short and challenging and yield was often very low. Iceland was never self-sufficient as a grain producer, not even before the cold period that began in the 14th century. During the early part of the “Little Ice Age”, as that period has been called, home-grown grain vanished almost completely. Barley disappears from the soil samples from Skálholt around 1400 AD and while barley cultivation may have survived a little longer in some lower-lying regions. Its cultivation had completely disappeared a century or so later and wasn’t attempted again until the 20th century. Barley is virtually the only type of grain known to have been grown in Iceland, while rye and wheat were imported. 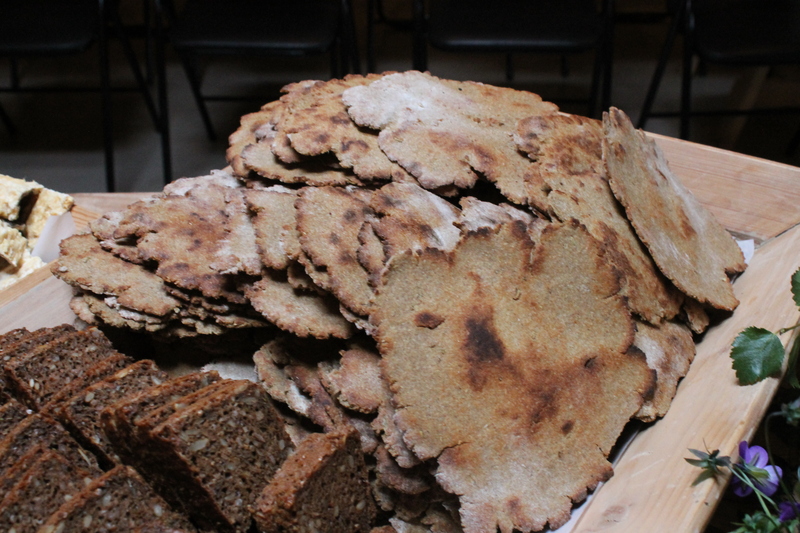 Imported rye gradually became the most important grain in the Icelandic diet; and wheat was used for fine baking by wealthy people, as well as being a staple ingredient for communion wafers. Even when grain was grown, it was probably used less for bread than for porridges as this was considered to be a more economical use of the grain than bread. The same applied to imported grains. Porridges are frequently mentioned in the Sagas and it seems that butter or other fat was sometimes added to them. Halli, of The Tale of Sneglu-Halli, is described as a great lover of porridge, although he refused to eat it until he burst, as was demanded of him by King Harold. Furthermore, some of the barley was used to brew ale, meaning that little was left over for breadmaking. This is not to say that bread was more or less unknown in medieval Iceland. It is mentioned often enough in the Sagas, usually in connection with some kind of spread or fat, and was probably much more of an everyday food than it became later on. Reykdæla Saga tells of a man called Þorgeir smjörhringur, Thorgeir Butter-ring, who gained his byname because his favorite food was bread and butter. This bread was probably always unleavened. As far as I know, there are no indications that any kind of leavening was used in western Scandinavian baking during the Viking era, and no ovens seem to have been in use. Three types of bread seem to have been made, thin flatbread baked on embers or hot stones, coarse, heavy bread buried in ashes and fine wheat cakes baked in a frying pan. Pans of this type have however not been found in Iceland so it is not certain they were used there until much later. Unleavened, coarse barley or rye bread cooked in embers or in a pan over an open fire may not sound appetizing but such bread can be quite good when freshly baked and still warm. It tends, however, to get rock hard as it cools down. It isn’t until the late Middle Ages that the lack of grain and especially the absence of bread in the diet, becomes so evident that most travelers who visit Iceland or others who write about it almost invariably mention this as a very peculiar thing. A common tale was that Icelandic farmers would gladly allow anyone who could provide them with a piece of bread to sleep with their daughters in exchange for this rare treat. The German cartographer Martin Behaim wrote this on his globe of 1492: “In Iceland are found men of eighty years who have never tasted bread. In this country no corn is grown, and instead fish is eaten.” The first part of his statement is certainly incorrect, bread was not that rare, but it certainly wasn’t everyday food for poorer people. They buttered their dried fish and ate it instead. During the 16th to 18th century, well-off people would have their servants bake bread but the majority of Icelanders rarely made or ate bread. 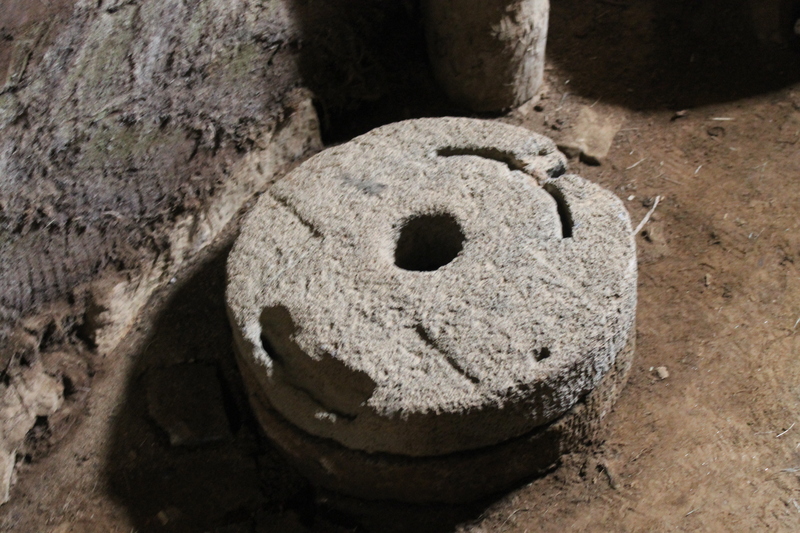 Due to a lack of firewood, ovens were virtually unknown, except possibly in a few very wealthy households, and there was no professional baker in the whole of the island until the early 19th century. Furthermore, there were no communal ovens on the island, and no grand houses with huge fireplaces or stoves. After grain cultivation disappeared completely, all grain had to be imported and consequently became even more expensive than it had ever been. Not only that, but in some years it was scarce or even completely unavailable. Only a handful of trading ships sailed to and from Iceland each year and sometimes bad weather, war or other calamities prevented them from risking the long and hazardous journey. As an example, no ship arrived in Iceland from Norway in 1326, resulting in a severe shortage of all imported commodities. The annals especially mention the lack of wine and say that mass couldn’t be sung in some churches due to the lack of sacramental wine. 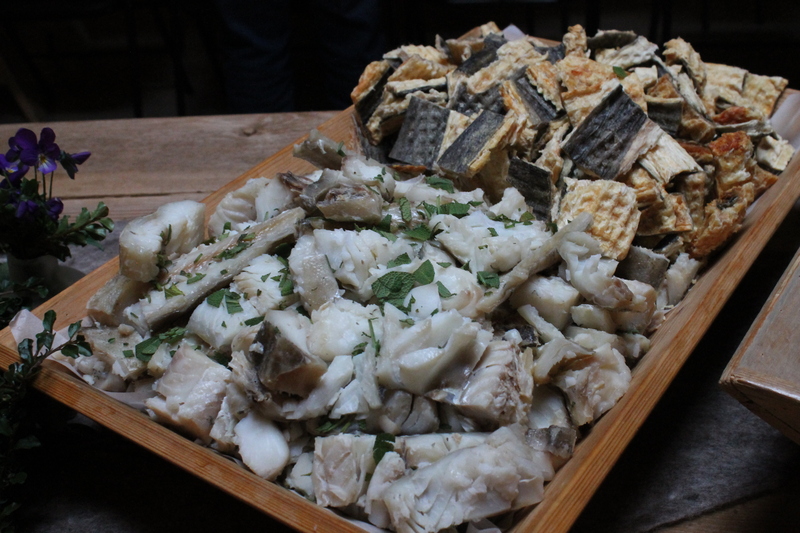 Harðfiskur (dried fish) and siginn fiskur (fermented fish). Things got a little better at the beginning of the 15th century, when English fishermen and merchants began to venture into Icelandic waters. They bought dried fish and homespun cloth from the Icelanders and sold them grains, all kinds of utensils and metal ware, wood, candle wax, weapons, and luxuries like honey. This was the so-called English century in Icelandic history. Several wealthy landowners who had possession of good harbors began large-scale fishing operations. Dried fish from Iceland fetched good prices in European markets and money trickled into the coffers of the Icelandic boat owners. It can safely be assumed that some of this wealth was used to import luxury foodstuffs, such as flour, vinegar, spices, dried fruits, and wine; the upper echelons of Icelandic society have always tried to emulate European haute cuisine. In fact, one of four versions of Libellus de arte coquinaria, one of Europe’s oldest surviving cookbooks, is in Icelandic. The manuscript probably dates from the last quarter of the 15th century and it is likely that the translation was made for a member of the powerful and wealthy Skarð clan. Nevertheless, the majority of Icelanders continued to be poor. They could not grow grain to sustain themselves, and they could not afford to buy all the grain they needed, nor could they rely on a steady supply to the island. In the first half of the 18th century the yearly grain imports – mostly rye – ranged from a quarter to half a barrel (47 to 94 pounds) for each household in the country; there is no indication that more had been imported earlier. There is one type of grain that grows wild in Iceland. This is lyme grass (Leymus arenarius), a hardy grass that is plentiful in many coastal and sandy regions in Iceland. Its seeds were sometimes used as food, especially in Southeastern Iceland; the earliest mentions of this date back to the 12th century. It was, however, very difficult to harvest and the yield was low. Despite this, it continued to be used well into the 20th century. It was used for porridges and flatbreads but seems to not have been mixed with other grains. So what was used instead of grains? Two very important staples were fjallagrös or Iceland moss, which is not a moss but a type of lichen that grows in many Arctic regions, and söl or dulse, a seaweed that can be gathered at low tide around the North Atlantic. Iceland moss is first mentioned in the 13th century law text of Jónsbók but it may have been used since the Settlement, although there may have been less demand for this during the first centuries, when life was easier. Iceland moss (Cetraria islandica) grows in northern Norway and was sometimes used there as food, at least during famines, although never to the extent that it was used in Iceland. It is hard and brittle before soaking and doesn’t look very edible but it was used in many dishes, sometimes as a grain substitute, sometimes almost as a vegetable. Its use seems to have increased gradually as grain cultivation diminished, becoming increasingly important in the Icelandic diet. In the vast wilderness of the North and Northeast, Iceland moss grew in abundance, and groups of people would go into the mountains to gather it, sometimes sleeping in tents for a week or more, returning with dozens of large sacks stuffed full of their pickings. The moss was then spread out to dry, picked over and stored in barrels or large sacks. It was then soaked before use, chopped and cooked. In many regions porridge and other food made from it was served every day, sometimes for every single meal. It was used in bread, soups, puddings, blood sausage, and many other kinds of food, as well as being made into teas and potions for numerous ailments. It is entirely possible that Iceland moss helped to keep the Icelandic population alive, not just as sustenance but also as medicine. Indeed, recent tests have proved it to contain substances that strengthen the immune system and might even prevent some diseases. There are even some who want to link the rise of tuberculosis in the late 19th – early 20th century to the disappearance of Iceland moss from the general diet. Another local plant that was often added to bread was the seaweed dulse (Palmaria palmata), which was gathered during low tide in late August, especially in Western and Southwestern Iceland. There is a clear regional difference here: in the north and east they had Iceland moss, in the south and west there was dulse. As I’ve already said, the use of dulse can probably be linked to Ireland and it may not be a coincidence that many settlers in the dulse-wealthy region of Breiðafjörður came from the British Isles. Dulse is mentioned in many old sources and it is clear that it was highly valued; churches often owned the rights to collect dulse in faraway regions and there was quite a brisk dulse trade in medieval times. Dulse is known to have been gathered and traded in 1118, and Iceland’s oldest surviving law texts mention the right to collect dulse and eat it whilst on another man’s land. 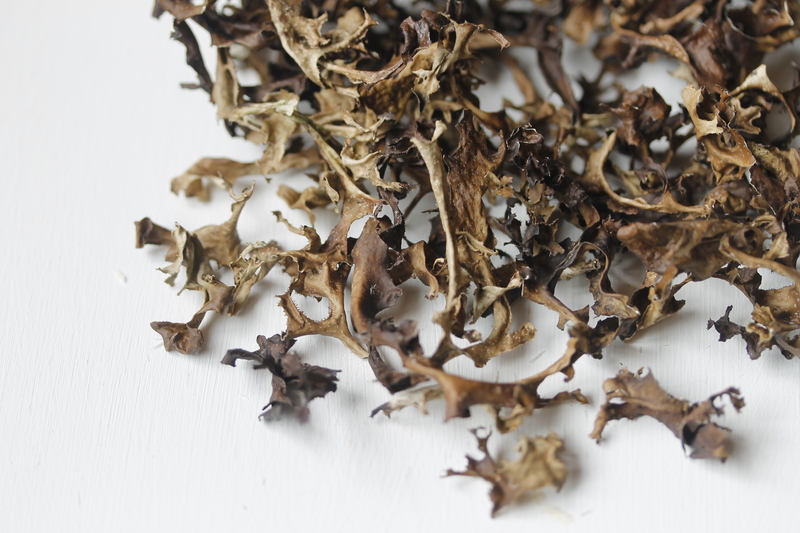 This means that dulse was also eaten fresh, not only dried as it is today. Egill apparently didn’t consider the dulse to be food so he also got some to chew on, not realising how salty it was. They both became very thirsty and called for some water but were given milk to drink instead (arranged by the daughter before she joined her father, of course). Egill was so angry at the trickery that he bit a shard out of the horn the milk was served in, and abandoned his starvation plan and composed one of his mighty poems instead. Now this is of course written three or four hundred years after the supposed event occurred, so it might not be the most reliable evidence of Egil’s dietary habits. 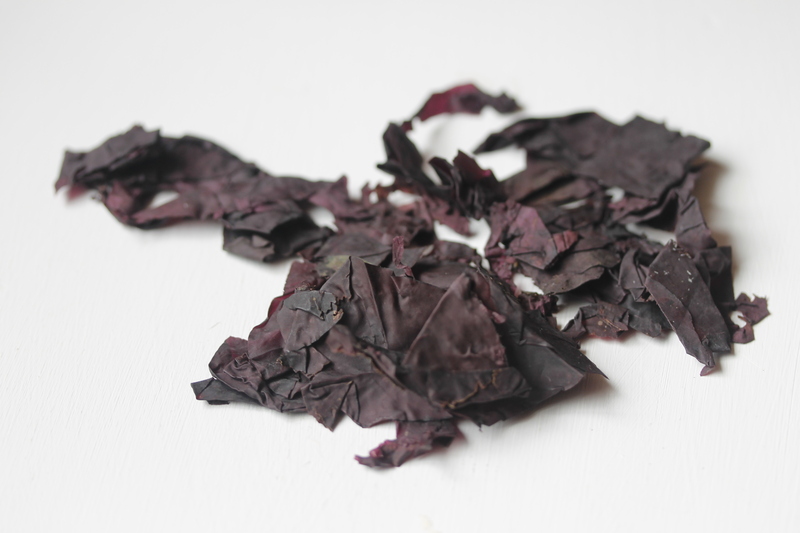 It does however tell us that in the 13th century, people seem to have had an idea that dulse might have been unfamiliar as food to a Viking of Norwegian origin, while his daughter – probably brought up partly by Celtic slaves and servants – would have known all about it. We don’t really know much about what the people of the Viking era used to flavor their food but several herbs and spices are likely to have been used. Among them are herbs like dill, wild thyme, coriander, and juniper berries, as well as wild onions, chives, and garlic. It is also likely that spices like cinnamon, cloves, and ginger were used to some extent. Some spices will certainly have been imported to Iceland as to other countries, at least from the 13th century onwards, and spices like pepper are mentioned in old documents. There are a few mentions of laukagarðar (literally “onion gardens”) in medieval Icelandic sources, mostly in connection with monasteries, although the most famous one is Guðrún Ósvífursdóttir’s garden in Laxdæla Saga. What is referred to here is probably herb or kitchen gardens, but it is unclear what was actually grown in these gardens. The onions in question are probably chives but old books do also mention garlic and unian, probably red onion. It is known that Norwegian monks grew some types of herbs and vegetables in the 12th century, such as turnips, peas, and beans, and it is not unreasonable to assume that this was done in Icelandic monasteries as well – there was quite a lot of contact, as Icelandic monks and priests often visited and resided in Norwegian monasteries and vice versa. A laukagarður at the bishop’s seat at Hólar is mentioned in 1457, although it is not clear if it was still in use at that time. The only onion growing wild in Iceland is the very rare wild onion (Allium oleraceum), thought to have spread from a farm in Borgarfjörður in Western Iceland where an English missionary bishop lived for at least 20 years in the 11th century. He, or someone connected to him, may have brought the onion there and the conditions are favorable, as this is a geothermal area and the ground there is warmer in places than elsewhere. Various “gardens” are mentioned in the late 13th century law texts of Járnsíða and Jónsbók but these texts are more or less direct translations of Norwegian law texts – this was only a few years after the Icelanders had sworn allegiance to the Norwegian king. These texts mention onion gardens and angelica gardens, but also apple yards, turnip fields, pea and bean fields “or any fruit that is protected with hedges or watches.” There certainly weren’t any apple yards in Iceland, so these texts can’t be relied upon as evidence. Honey from cultivated or wild bees was of course a natural sweetener which the settlers were used to, but this was not an option in Iceland. Honey could of course be imported – and was, probably mostly for brewing mead – but it was an expensive luxury and probably something the average Icelander very rarely tasted, if ever. The food was definitely lacking in sweetness – the only imported fruit available was dried and expensive, and the native berries were rather tart. Northern Norway and Sweden are known for an abundance of delicious berries – lingonberries, cranberries, cherries, wild strawberries, bilberries, blackberries, and so on. Only three types of berries grow in any significant amounts in Iceland – bilberries, which are not too common, bog bilberries, and the lowly crowberries, not really considered edible in many countries where they grow. In Iceland, however, they grow abundantly and were considered a real treat. They were also a valuable source of vitamins and could be preserved in sour skyr throughout the winter. Berries are not often mentioned in old sources but it is known that they were gathered, and also that crowberry wine was made at the bishop’s seat at Skálholt, probably because imported sacramental wine was so often in short supply. Angelica was grown and grew wild in Scandinavia in Viking times. It grows wild in Iceland – one of the very few tall plants that are hardy enough to thrive there – and is relatively easy to cultivate. It can be assumed that it was probably also grown in special angelica gardens at many farms, especially as soil erosion began to destroy its habitat. The roots and stalks of the plant were boiled and then buttered and eaten as vegetables, often with dried fish or dulse. The leaves were chopped and used in soups and stews. Kál is mentioned several times in medieval sources. This is the same word as “kale” and in modern Icelandic, it more or less covers the cabbage family but it is by no means certain what the old sources mean. Kál may be a specific vegetable, or it may be a term loosely applied to vegetables in general. One of the plants known as kál in Iceland was skarfakál, scurvy grass (Cochlearia), a valuable source of vitamin C in many regions. Some herbs were also collected and dried and used for various ointments, health cures and herbal teas. The most used herbs for tea were blóðberg (wild thyme), vallhumall (yarrow), rjúpnalauf (mountain avens), and ljónslappi (lady’s mantle). There were no large game animals to hunt in Iceland but the settlers brought livestock with them – sheep, cattle, pigs, horses, and goats, as well as chickens, geese, and maybe ducks as well. They probably tried to let the animals run wild at first, foraging for food in the woods but will soon have discovered how severe the Icelandic winters can be. Hay and other feed had to be provided, although sheep and goats could fend for themselves far better than the cows, especially as a high proportion of the adult sheep were castrated rams (wethers); hardy animals, raised mostly for their wool and well equipped for the Icelandic winter climate. But cows produce much more meat and beef was probably far more common during the first centuries of Iceland’s history than later on, when the cattle was almost exclusively used for dairy production. The pigs probably mostly ran wild and gradually disappeared as the island became deforested. 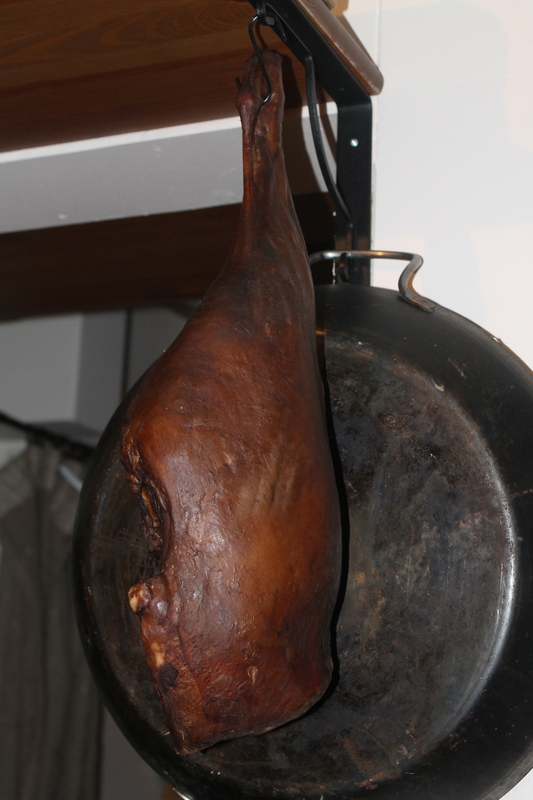 A smoked leg of lamb hanging in a modern kitchen. It is not unlikely that meat was a more dominant factor in the Icelandic diet than it had been in the settler’s countries of origin. However, fresh meat was usually only on the menu for a few weeks in the fall, although well-off people sometimes slaughtered a lamb or gelded ram for Christmas and other special occasions. Almost all meat and offal was smoked or preserved in whey. In a cold, harsh climate, people need a lot of calories to survive, so fatty meat and pure fat were highly prized. There is evidence to suggest that sausages made in Iceland were particularly fatty. Geese and hens are mentioned in old sources although they were probably not very common. In some regions, seabirds and their eggs formed a large part of the diet, especially during spring and by early summer, when little else was to be had. The birds occupied soaring, almost inaccessible cliffs – a single cliff can be home to millions of guillemots, razorbills, auks, ,puffins – but once you got near them, they were relatively easy to catch; an experienced catcher could bag hundreds of birds in one day. Medieval sources show that ownership of, or access to a bird cliff was highly valued even then. Wild geese, ducks, and swans were also hunted. Whale meat and blubber was eaten whenever available and a large whale that stranded on the shore could provide meat for the whole surrounding region for a long time. Seals were hunted for their meat and hides. It is likely that after the Icelanders adopted Christianity in the year 1000 BC, even more seal and whale meat was consumed than before, as the meat often seems to have qualified as fish, and could be eaten on fasting days. In 1481, Pope Sixtus IV wrote a letter to bishop Magnús Eyjólfsson of Skálholt, where he says that Icelanders can, without penalty, eat “the marine fish known as seal” during fasting days. Salmon, trout and Arctic char was fished in the rivers and lakes, and the rich fishing grounds close to the shore were utilized very early on. The fishing boats were small, open rowing boats, never larger ships. As has been noted earlier dried fish played an extremely important part in the diet, at least from the 14th century onwards, and probably even earlier. It was on the menu daily and replaced bread in some ways. The fish was gutted and hung out to dry on racks. It was left to dry completely; the cold, windy climate of Iceland is ideal for this. When the fish was to be served, it was beaten thoroughly with a mallet to soften it. The fish was then eaten with butter or other fat, such as fish oil. It was not usually cooked, which was an added bonus in the fuel-starved island. Even the fish heads were dried and every edible scrap was consumed. The dried fish kept well and was easy to store. 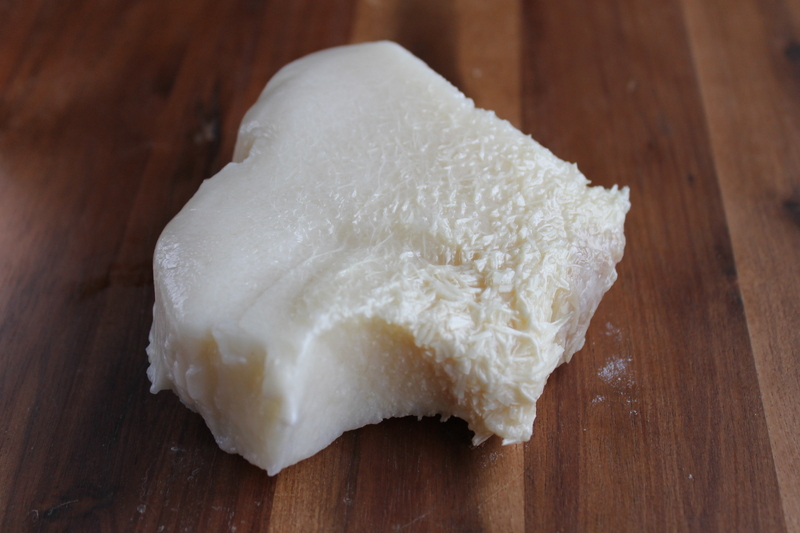 It was also lightweight – a dried cod or haddock will lose at least 80% of its weight in the drying process. This also means that a lot of butter or other fat was needed to make the unsoaked, uncooked fish palatable, and people would spread their flat fish pieces liberally with butter. I sometimes joke that the current popularity of low-carb diets in Iceland, with lots of proteins and fat but no sugar and no or very little grain, is more or less a revival of old food traditions – after all, the whole nation was on just such a diet for a thousand years. Iceland is a country completely surrounded by saltwater and it is probably surprising to many that one of the things that had a great impact on Icelandic food culture was the lack of salt. When salt is harvested from the sea, it is usually done by evaporation, either naturally, by using the heat of the sun to dry up shallow pools, or by boiling the water until only salt crystals remain. The first option is clearly not very viable in Iceland, as the climate is neither hot, sunny, nor dry. Boiling the salt was possible at first, and consequently the settlers will have been able to use salt in roughly the same way as they were used to, but after a few centuries, possibly even a few decades, the lack of firewood had already become a problem. Boiling seawater for salt harvesting is a fuel-intensive process and the demand for wood for other uses was took precedence. As a consequence people tried to economize. During the winter, barrels could be filled with seawater and left until a thick layer of ice had formed. This was then removed and the process was repeated a few times, until the salt in the remaining water was so highly concentrated that it didn’t freeze. Then it was boiled but the process took a much shorter time than usual and less fuel was needed. Another frequent method was to gather seaweed and dry it. The dried seaweed was then burned and the salty ashes used to preserve food. This was called “black salt” and was used when nothing else was available, but of course the food was contaminated with ash and grits. Despite these ingenious methods, the lack of salt became a problem early on. Some salt was imported, at least from the 16th century onwards, but it was very expensive. Most people couldn’t really afford it. This meant that other methods had to be discovered in order to preserve the food. Indeed, the need to preserve meat, for instance, was greater in Iceland than in many other countries. Almost all slaughtering was done in the fall or early winter, as hay and other feed for the animals had to be conserved as much as possible and it wasn’t economical to feed an animal until it was needed for the table. It is possible that some of the hardier animals could be left to forage for themselves in the dwindling woods during the first couple of centuries, but this often proved hazardous, as Flóki Vilgerðarson, who tried to settle in the West Fjords in the late 9th century, learned the hard way. According to the Book of Settlement, he neglected the necessity of providing fodder to the animals and lost all his livestock during a harsh winter. Flóki subsequently returned to Norway; giving the country he had tried to settle its present uninviting name as a goodbye present. So what options did the Icelanders have to preserve their meat and fish? Given the name Flóki saddled their country with, freezing might be the most viable option at first glance, but the famously unreliable Icelandic climate makes that option very unreliable; Iceland may be cold but it isn’t really that cold, at least not as consistently as people may think. The climate in Iceland is not dry enough to make air-drying of meat a real option, although as has been discussed earlier, fish was usually dried. Much of the meat was smoked but that method usually demanded some salt and wasn’t really suitable for the more perishable parts of the animal. With such limited options, Icelanders developed their own preserving methods, using one of the few things they had more than enough of – whey. Food preserved and fermented in whey. The late and lamented Icelandic culinary historian Hallgerður Gísladóttir, who did a lot of research on whey preservation, said that she had not come across this method anywhere else. Pickling or preservation of food in fermented whey for preservation was known in Norway in Viking times but the method was never widely used as Norwegians had lots of firewood and could process salt from seawater by evaporation. In Iceland, whey preservation became common early on. This is evident from archaeological research. When ancient farmsteads are excavated, remains of several huge barrels are usually found dug down into the kitchen or larder floor. These barrels will have been filled with soured or fermented whey, sýra, which in Iceland was usually a byproduct of skyr-making. Fermented whey is an excellent preservation agent; I have myself, as a child, eaten blood pudding and other food that had been kept in sýra for well over a year, in an unheated (and unrefrigerated) room. The fact is that fermented whey not only preserves the food and its nutrients remarkably well, it can even add to the nutritional value of it since vitamins from the whey seep into the preserved food. It also tenderizes and softens the meat and gradually softens and dissolves bones. Fish and cattle bones were sometimes kept in the fermented whey until they had softened and then they were boiled and eaten, although they seem to have been a rather unpopular dinner. Food that is kept in fermented whey for some time will gradually acquire an increasingly sour taste. It is sometimes said that all food will eventually taste the same if it is kept in whey for long. 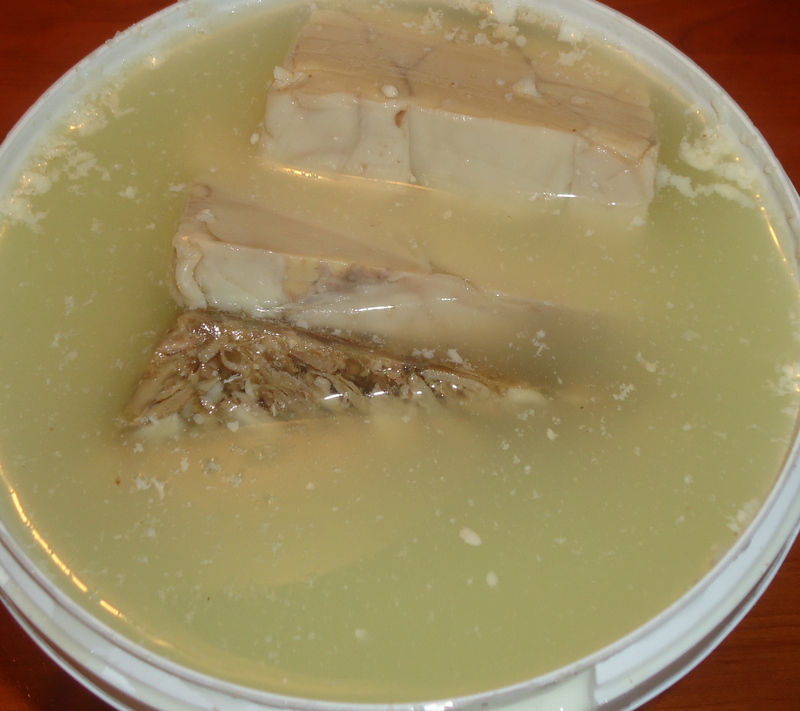 Food that was preserved in this manner was usually boiled and cooled before being submerged in the whey. A lid was then placed on top and if the barrel was to be kept undisturbed for some time, some tallow was usually melted and poured over the rim to seal it. 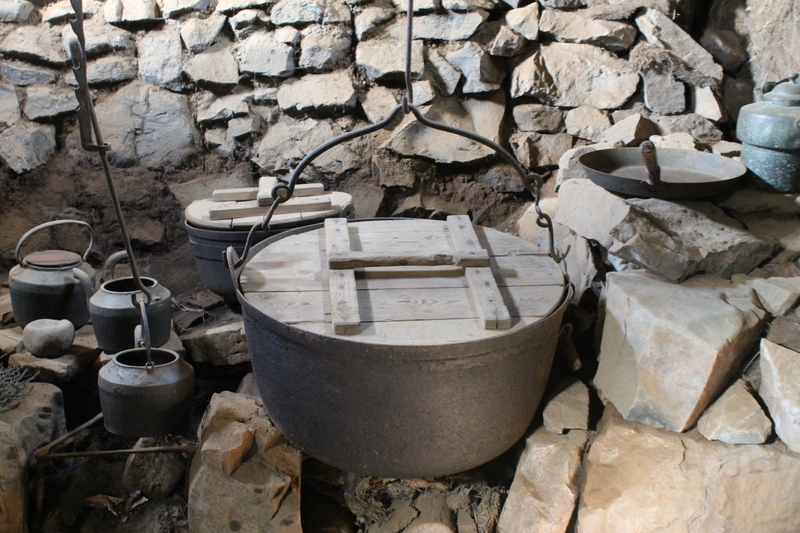 Fermented whey was not just used to preserve food. It was used to flavor soups and porridges, and possibly to marinate meat, but it was mainly used as a beverage. The use of fermented whey as a refreshing drink was not unknown in Norway, but it became so prominent in Iceland that 12th century Norwegians remarked upon it. The main reason for this is of course the lack of beer and ale. Some beer was brewed in Iceland in the Middle Ages but after barley cultivation disappeared completely, sýra became the local substitute. It is not alcoholic but it can be very refreshing and tasty for those who have acquired a palate for it. It used to be said that two-year old whey was fully developed. By then, it was so sour that it was usually diluted generously with water, sometimes 1 part sýra to 11 parts water. Milk and dairy food was one of the mainstays of the Icelandic diet. Cow’s milk was by far the most common in the early period but gradually the cow population shrank, the sheep population grew, and ewes became more important in dairy production. The settlers brought goats too and the wealth of place names that can be linked to goats indicates that they were fairly common at first. They are also mentioned several times in old sources such as law texts, but their importance seems to have declined fairly rapidly, possibly as the deforestation expanded. But they never disappeared entirely. There are several indications that quite a lot of milk was drunk fresh in the Middle Ages in Iceland. It was considered to be ideal food for invalids and old people and when people made pension contracts with convents or monasteries, for instance, they would sometimes stipulate that they should be given a certain amount of milk to drink each day. 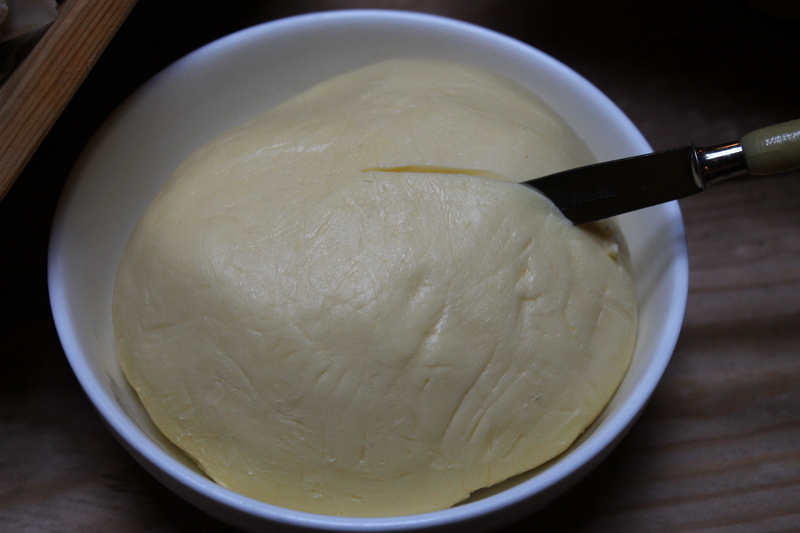 Homemade butter. Sweet, not soured. The main use of milk, however, was for making dairy products like butter, cheese and skyr. The Icelandic butter, due to the lack of salt, was usually not salted. It was soured, or rather fermented. This was an Icelandic specialty that has completely disappeared – and should not be mourned, if descriptions of visitors to Iceland in the late Middle Ages and later are to be believed. The Icelanders themselves liked it, and even when salt became more affordable, many continued to prefer soured butter. It was also said to keep much better than the salted butter – up to 20 years, according to some sources. The Icelandic cows seem to have produced fattier milk than the cows of neighboring countries, perhaps considerably more so, and quite a lot of butter was being produced. Rent was usually paid or at least calculated in butter, and rich landlords, churches and bishop´s seats accumulated huge butter mountains. The settlers brought their cheesemaking skills with them to Iceland and cheeses are often mentioned in old Icelandic documents. The Sagas also mention them several times. It is clear that cheesemaking was widely practiced, probably on every farm, and as with rent, taxes were often paid in cheese or butter. As life gradually became more challenging in the late Middle Ages, cheesemaking gradually diminished and during the 18th century, it disappeared almost completely. The reason for this is probably that skyr was thought to be more economical than cheese; the yield from the milk was higher when skyr was made than when the milk was used for cheesemaking. The lack of salt may also have played a role, since cheese was usually salted to preserve it, but skyr needed no salt at all. Skyr is an Icelandic specialty that has been made since the Settlement so it was probably brought over from Scandinavia. There is evidence of skyr being available in medieval Norway, but only in Iceland did skyr-making continue and become a very important part of the national diet. Skyr was made with either sheep’s or cow’s milk, although in modern times it is made from cow’s milk only. The milk – usually skimmed – is curdled with bacterial cultures and rennet. The culture comes from a starter kept from the last batch of skyr and the rennet was usually made from calf’s stomach, although butterwort (Pinguicula vulgaris) could be used in a pinch. Rennet is actually not mentioned in pre-16th century Icelandic sources but that doesn’t mean it wasn’t used before that time. However, some of the skyr mentioned in old sources seems to have been a lot thinner at the time as there is mention of people sipping or drinking skyr. This probably means that the skyr was not drained. Later on, it was usually left on a sieve to drain and often became thick enough to be cut. The thin, unsieved skyr was also used to preserve food, much as whey. As for cooking methods, boiling was by far the most common; there were no ovens for roasting and no medieval frying pans have been found in excavations. Meat was sometimes roasted on a spit but probably mostly when a cauldron or another cooking vessel was unavailable. But even the cooking pots were in short supply. Some bog iron can be found in Iceland, but not nearly enough to make the cooking vessels that were needed: the clay in Iceland is not suitable for pottery, and so on. Cauldrons and pots had to be imported and were expensive. In AD 1345, the bishop of Skálholt felt it necessary to issue a ban on using baptismal fonts and bowls for non-sacramental use, presumably in order to prevent people from using them to cook soups and stews. Wealthy men often bought cauldrons and rented them out. Grágás, the medieval Icelandic law book, sets out the standard dimensions of iron cauldron which should have a capacity of 30 liters, or around 8 gallons. But most of the Norse and old Icelandic cauldrons that have been found have been notably smaller than this. 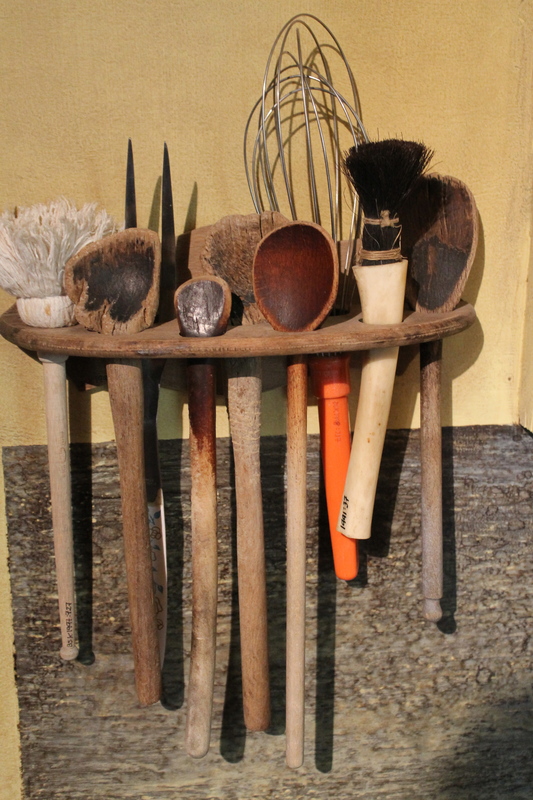 Some Icelanders did have an alternative, fuel-conserving method for cooking. They simply cooked their food in the nearest hot spring. Sometimes the food was placed in a cauldron or other container which was then lowered into the boiling or almost-boiling water; sometimes it was buried into the hot earth close to the spring. We know that hot springs were used for cooking in medieval times, because a source dating back to 1199 tells of two womenwho were carrying a cauldron home from a spring and had an accident. Geothermal heat was probably used mostly for baking bread, or steaming it, and is still used in this way in Iceland; you can buy hverabrauð (hot spring bread, a dark, moist rye bread) in some shops. The dough is placed in a closed container, buried in hot earth and left to steam in its own moisture for up to 24 hours. For most cooking however, the most commonly used fuel, after a few centuries of deforestation, was either peat or dried sheep manure. This continued into the 20th century and sheep dung is even used to this day for smoking meat and salmon. Trees and shrubs had almost completely disappeared in many regions after a few hundred years and firewood was certainly not something to be wasted. Indeed, some have noted that it is no coincidence that almost all witch burnings in Iceland took place in the West Fjords as they usually have a regular supply of driftwood. It is obvious that everyday Icelandic cookery, even from the earliest times, differed in many ways from contemporary Northern European cookery, and I think it is safe to say that this does not reflect changing tastes. There are indications that the settlers tried to continue doing things as they always had, but were – either quickly or gradually – forced to adapt to a harsher environment. Icelandic cuisine was for almost a thousand years a cuisine of wants – want of grain, want of fresh produce, want of salt, want of fuel, even want of cooking vessels and utensils. The people of Iceland had to pay a certain price for choosing to live somewhere north of life, but they adapted to their environment and managed to survive for a thousand years on what they had. Björnsson, Árni: Saga daganna. Reykjavík, 1993. Brears, Peter, Black, Maggie, Corbishley, Gill, Renfrew, Jane, and Stead, Jennifer: A Taste of History. 10,000 Years of Food in Britain. London, 1993. Gísladóttir, Hallgerður: Íslensk matarhefð. Reykjavík, 1999. Granlund, John: Bakning. Kulturhistorisk leksikon for nordisk middelalder I. Helsingfors, Copenhagen, Malmö, Oslo, Reykjavík, 1956-1978. Grewe, Rudolf, and Constance B. Hieatt, editors: Libellus de arte coquinaria: An Early Northern Cookery Book. Tempe, 2001. Grøn, Frederik: Om kostholdet i Norge fra omkring 1500-tallet og op til vår tid. Oslo, 1942. Grøn, Frederik: Om kostholdet i Norge indtil aar 1500. Oslo, 1928. Guðjónsson, Skúli V.: Manneldi og heilsufar í fornöld. Reykjavík, 1949. Kristjánsson, Lúðvík: Íslenskir sjávarhættir I-V, Reykjavík 1980-1986. Larsen, Henning: An Old Icelandic Medical Miscellany. MS Royal Irish Academy with Supplement from MS Trinity College (Dublin), Oslo, 1931. Olsson, Alfa: Kokning. Kulturhistorisk leksikon for nordisk middelalder VIII. Helsingfors, Copenhagen, Malmö, Oslo, Reykjavík, 1956-1978. Rögnvaldardóttir, Nanna: Icelandic Food and Cookery. New York, 2002. Shephard, Sue: Pickled, Potted and Canned. The story of food preserving. London, 2000. Skaarup, Bi, and Jacobsen, Henrik: Middelaldermad. Kulturhistorie, kilder og 99 opskrifter. Copenhagen 1999. Veirup, Hans: Til taffel hos kong Valdemar. Europas ældste kogebog eftir to middelalderhåndskrifter fra 1300tallet. Herning, 1993. Icelandic foodways probably did not change all that much until the late eighteenth century, when educated men, influenced by the Age of Enlightenment, began to try to teach their countrymen to grow vegetables, and use the food they already had in new ways. They did not meet with much success at first. Icelanders generally distrusted this newfangled food. But things gradually changed. Traditional Icelandic food – the food most people born in the 1960s and earlier grew up on – is to a very large extent influenced by Danish cooking. Iceland had been under Danish rule since the Middle Ages but it wasn’t until the nineteenth century that this began to be reflected in the cooking to any great extent. Most of the traditional Icelandic cake and cookie recipes came from Denmark, and so did a great many dishes that are now considered extremely Icelandic in character. Danish cookbooks were in use in Iceland during the nineteenth century and the earliest Icelandic cookbooks are largely translations and adaptations of Danish and Norwegian cookbooks and recipe collections. The first of these, Einfalt matreiðsluvasakver fyrir heldri manna húsfreyjur (A Simple Cookery Notebook for Gentlewomen), was published in 1800. The authorship of this small book is very unclear, with conflicting evidence put forward by a man who certainly did contribute to it, Magnús Stephensen, president of the High Court of Iceland, and a real gourmand. Whoever the author or authors were, they came from the uppermost layers of Icelandic society and the recipes in the book clearly reflect that. This is not what Icelandic housewives were cooking at the time. This is upper-class Scandinavian late 18th century cooking, described to enable well-off Icelandic housewives to entertain their families and guests, although two versions of many dishes are presented – one for the upper class, one for the workers. However, this book never became widely known, or much used. 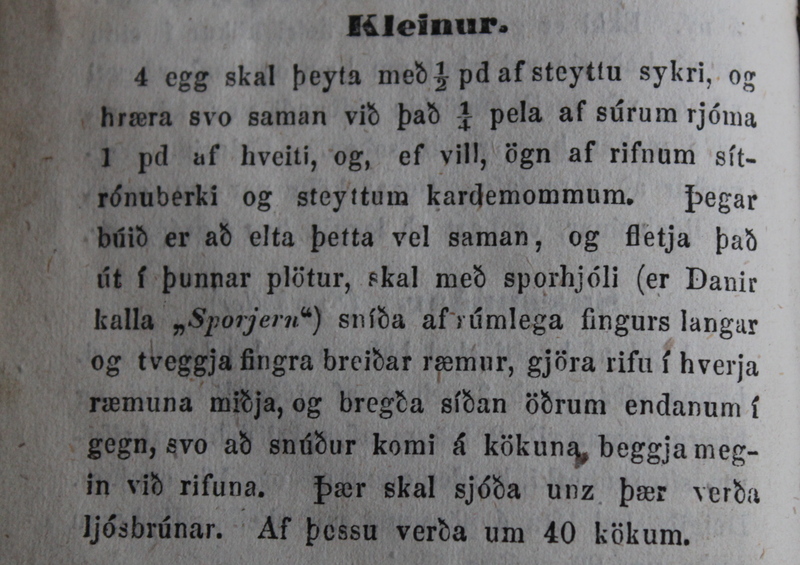 A recipe for the very popular kleinur (twisted doughnuts) from Ný matreiðslubók (1858). The second oldest cookbook, Ný matreiðslubók ásamt ávísun um litun, þvott o.fl. (A New Cookbook, With Instructions on Dyeing, Washing, and More) by Þóra Andrea Nikólína Jónsdóttir, which is a much more substantial work, was not published until 1858. Although large parts of it are more or less translated from Danish cookbooks of the time, there are many unquestionably Icelandic recipes in the book. The author was born in Copenhagen of an Icelandic father and Danish mother and spent her childhood in both countries. She was probably educated in Denmark, but married an Icelander and first lived on a farm before moving to the town of Akureyri. This meant that she had gained a wide range of experience, which clearly comes through in her book. The first truly Icelandic cookbook was Kvennafræðarinn (The Women’s Educator), first published in 1889, of which 3000 copies were sold in the first year. The author, Elín Briem, established and ran one of Iceland’s very first homemaker schools. It became the first Icelandic-language cookbook to gain wide distribution. It was reprinted three times and became very influential. At the beginning of the 20th century, most Icelandic rural homes were still largely self-sufficient regarding food, even though grains, sugar, coffee, and a few luxuries had to be bought in the village store. This was also true of many town homes; even in Reykjavík many still kept cows, sheep or hens in a shed in their backyard. But this was also the time of great changes in Icelandic kitchens: The open fireplace was giving way to the cooking stove, and the stoves had ovens for baking. This opened up a new world and Icelandic hospitality underwent a big change. Now visitors were no longer offered dishes heaped with smoked lamb, dried fish, and whey-preserved food. Instead, they were served mountains of cakes and other baked goods; yet this was only the beginning of the Icelandic cake deluge. Ovens had been virtually unknown in Iceland up to this time, except in a few wealthy homes. Cookies and pastries had mostly been fried in fat – pancakes, crêpes, bows, and other goodies. The early ovens were not easy to operate, lacking any thermostats of course, and it was an art to arrange the hot coals and other fuel so that the cakes and cookies baked evenly. They often had to be turned several times while baking. Still, Icelandic housewives managed to churn out vanilla wreaths, crescents, spice cookies, cones, almond macaroons, and innumerable other cookies and cakes in these ovens. And let’s not forget the vínarterta, served at all coffee parties at the turn of the century. Most dishes were fairly bland; few spices were used and then sparingly. Often salt and pepper were the only flavorings, but some housewives had cinnamon, ginger, cloves, allspice, bay leaves, and sometimes nutmeg, dried lemon peel, and vanilla extract in their cupboards; only the very brave ones had a jar of curry powder to add to their fricassee sauce – but did so very timidly. A traditional Icelandic curry is very mild indeed. Some recipes mention “soy,” not oriental soy sauce, but gravy browning – a homemade or store-bought caramelized coloring for brown sauces. Onions were imported but most other vegetables used were those that could be grown in Iceland: Potatoes, rutabagas, turnips, kale, and a few others. Fresh fruit was rare, with the exception of berries and rhubarb (always treated as fruit in Iceland). Porridges and puddings were very popular and for special occasions many people either made a grand multi-layered dessert like trifle, or maybe a custard flavored with vanilla, rum, almonds, lemon peel, chocolate, coffee, or even canned pineapple. However, for those who could afford it, in the late 19th century up to WW1 or even until the Great Depression, the stores actually carried a much wider selection of imported food than could be bought in later decades. These included canned meat, vegetables and fruit, condiments, cheeses, and other luxuries. A hundred and ten years ago, a Reykjavík store could advertise “Parmesan and Gorgonzola cheeses, directly from Italy”. Those cheeses disappeared during the war and were not seen again in Icelandic stores until around the turn of the century. During the twenties and thirties, the increasing influence of home economists and cooking teachers at the homemaker’s schools that had been established in many regions (the so-called “porridge schools”) could be noted clearly. As a matter of fact the cookbooks of the Depression era placed greater emphasis on varied everyday food than most earlier books had done. During WW1, many of the luxury food items that had been available in Icelandic stores disappeared or became even more expensive. Some of them appeared again after the war, but that changed quickly when the full force of the Great Depression hit. Icelanders couldn’t sell their fish abroad, there was a severe currency shortage and prices soared. In the fall of 1931, severe restrictions were set on all imports, not least food. Some imported food gradually appeared again but was often restricted – there was a time when you needed a doctor’s prescription to buy any of the few fruits that were occasionally available – but other things, such as all meat and dairy products, could not be imported again for many decades, and in some cases restrictions or quotas still apply. WW2 brought more changes. Iceland was occupied, first by British soldiers in 1940, which lead to the opening of several fish and chip shops in Reykjavík, and in 1941, the Americans took over and brought with them hamburgers and many other previously unknown foodstuffs. At this point American fast-food culture began to develop. In the homes however, the cuisine continued to be Danish-influenced. The most influential cookbooks of the early and mid-twentieth century are without question Jóninna Sigurðardóttir’s book, first published in 1915 as Matreiðslubók fyrir fátæka og ríka (A Cookbook for Poor and Rich; the subsequent editions were just called Matreiðslubók); and Helga Sigurðardóttir’s Matur og drykkur (Food and Drink), first published in 1947 and revised several times. Both these ladies had been educated in Denmark and their cooking is sound middle-class Danish cooking, with an Icelandic twist. Helga Sigurðardóttir can safely be called the grand lady of Icelandic cooking. She wrote several popular cookbooks before she published Matur og drykkur, which soon became the Icelandic kitchen bible and remained in that position for decades. This is the epitome of Icelandic-Danish cooking, the comfort food modern-day Icelanders feel nostalgic about but rarely cook themselves; flour-thickened sauces, the Sunday roast leg of lamb, pork roast with crackling, lemon mousse, prune compote, fish salad with mayonnaise sauce, meatballs in brown sauce with jam, and Danish apple charlotte. Most meals in those days had two courses; the main course and a substantial dessert. The main course was usually fish or meat, simply cooked and served with potatoes in some form. Potatoes were an integral part of each meal and to this day, many still refuse to consider a meal complete without them. 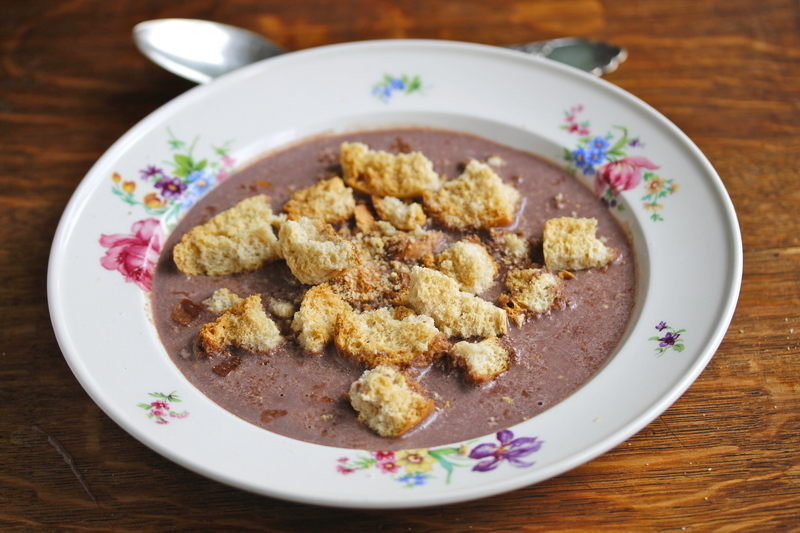 On weekdays, the dessert was usually a porridge, milk pudding, or a soup of some kind. Fresh vegetables were a bit more varied than they had been earlier and cultivation was increasing. Cabbage and cauliflower largely replaced kale, and carrots replaced turnips. Tomatoes and cucumbers began to be grown in greenhouses heated with water from hot springs, but they were still rare. Many Icelanders used to view vegetables primarily as a supplement, something to make the “real food” last longer, and when they could afford to buy their fill of meat and fish, they saw no reason to add greens, often called “cabbage food.” Variety increased by the 1940s; for instance Matur og drykkur has some recipes using both fresh and canned mushrooms. Other canned vegetables, like string beans and asparagus, were also available by then. The use of tomatoes was increasing and the Icelanders also discovered tomato ketchup and mustard. 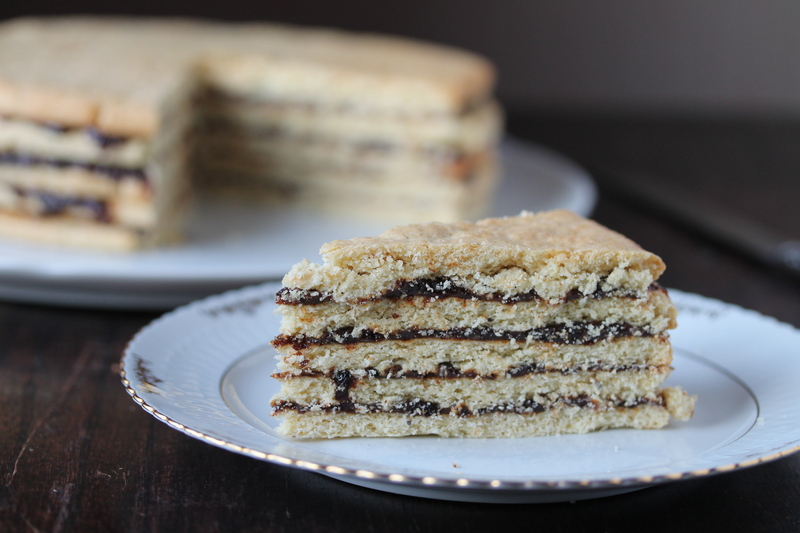 During the war, elaborate cream-filled layer cakes and tortes made an entrance in Icelandic coffee parties. Besides whipped cream, these grand creations were often decorated with jam, buttercream, custard, almond paste, canned fruit, and candy. Fresh fruit – apples, oranges, and sometimes bananas and pears – were mostly seen at Christmastime. The increase in the use of spices was limited but still a few newcomers like paprika made their appearance. On the other hand, spices like cinnamon, cloves and allspice had virtually disappeared from savory recipes even though they were still used in sweet dishes and cakes. Dried herbs were almost unknown and fresh herbs were rare, with the exception of parsley, chives, and dill. It was in the 1960s that Icelanders regularly began to travel abroad, and cooking trends from foreign, but not exotic, countries became more evident. These were the “shrimp cocktail years” of the western world and Iceland was no exception, except “cocktail sauce years” may be a more accurate term. The omnipresent Icelandic kokkteilsósa was invented in the early years of this decade, without a doubt influenced by European shrimp cocktail sauces, although the Icelandic version enjoys a much more versatile role. Shrimp cocktail (a modern version). In the home, the Sunday roast leg and rack of lamb still held the throne but breaded and pan-fried lamb and pork cutlets and lamb Wiener schnitzel decorated with capers and a slice of lemon (and sometimes a small slice of herring) were also popular treats. Some people were even more daring and made roast beef or T-bone steak on festive days. Poached or pan-fried haddock was still the most common everyday food and any meat or fish that was pan-fried was usually covered with breadcrumbs and fried in lots of margarine or butter. Meat was usually well done or overdone and fish and vegetables were often overcooked as well. Additionally, dishes made from ground meat became increasingly popular during this period. Icelanders were slowly learning to eat vegetable salads and the most common was coleslaw made from grated or shredded cabbage, grated carrots, and chopped apples, often with lots of mayonnaise. A salad made from grated carrots and raisins was also very common and both were frequently enriched with crushed canned pineapple. Other accompaniments mostly stayed the same: boiled potatoes, sometimes glazed, and boiled vegetables – such as “ORA green beans” (named after the canning factory that produced them; actually marrowfat peas) – but rice and spaghetti were increasingly beginning to be consumed, largely as additions to, not replacements of the ubiquitous potatoes. Spaghetti was mostly served in a so-called “Italian sauce,” usually a béchamel sauce with some tomato paste or ketchup added. Trade restrictions were beginning to ease a little and some types of vegetables and fruits were available year round. Desserts made from fresh and canned fruit partly replaced the dried fruit compotes, sweet fruit soups, and gelatin desserts of earlier decades. The first pizza parlor was opened in 1969 but did not survive for long. Just a few years later, most people were familiar with pizzas and some even knew how to make them. These early homemade pizzas were usually covered with a thick layer of fried ground meat, ketchup, canned mushrooms, pineapple chunks, and grated cheese. Hamburgers invaded the roadside shops. They were fried to death, often served with a pineapple slice and a fried egg, and almost always eaten with a knife and fork. Various kinds of seafood and vegetable gratins gained popularity during the 1970s and 1980s, partly due to the influence of the Icelandic Dairy Produce Marketing Association. New types of cheese were now being manufactured and the Association’s experimental kitchen was constantly churning out colorful leaflets with recipes introducing people to these new cheeses. Dishes that combine fish and cheese are more often seen in Iceland than in most other countries, probably due to the influence of these leaflets. 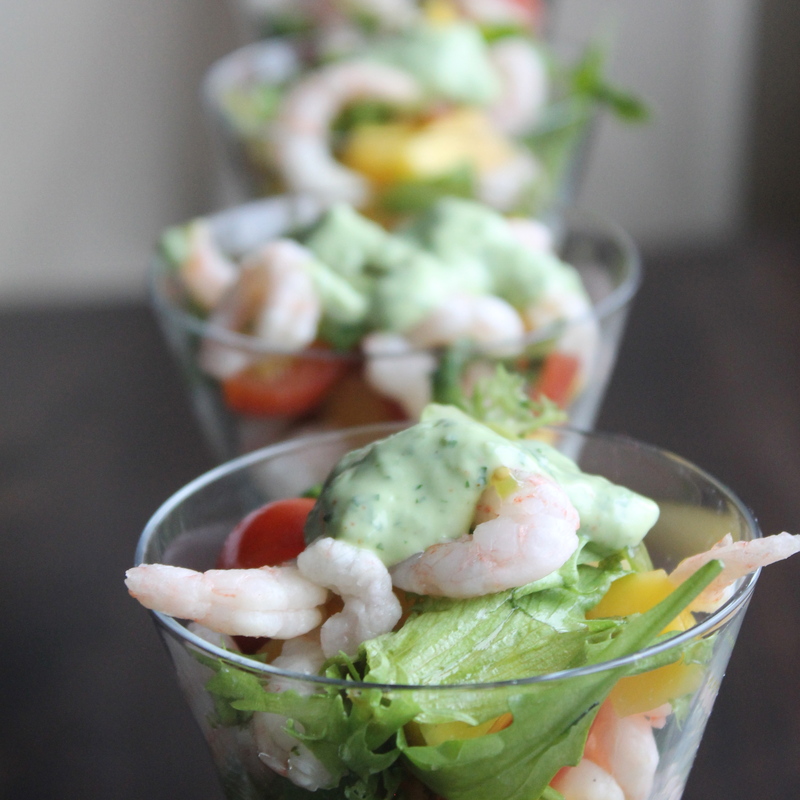 Icelanders also learned to appreciate langoustines and shrimp, formerly regarded with horror, and a shrimp dip with Ritz crackers became an obligatory party food. Scallops also gained popularity, along with many types of fish, such as monkfish and ocean perch that had not been consumed before. The Icelandic restaurant scene underwent dramatic changes in the 1980s and new restaurants mushroomed. People began to dine out without a special reason, which had been almost unheard of, and they found many unfamiliar tastes to savor as Italian, Chinese, American, and Indian restaurants emerged. People began to experiment with those new flavors at home, despite a significant lack of suitable ingredients at first. At the same time, more and more types of bread became available in bakeries, which for years had mostly sold a few types called vísitölubrauðin (The Index breads) which owe their name to their price being directly linked to the inflation index which was deliberately kept low by government regulations. An increasing awareness of nutrition and a healthy diet could also be noted. Despite this awareness, there was a fast-food boom, and hamburgers, french fries, fried chicken, pizzas, and pasta dishes began to replace haddock and potatoes as everyday food to some extent. At the same time, side salads and vegetables also became increasingly popular, although Icelanders still eat fewer vegetables than all the neighboring countries. At the beginning of the new millennium, Icelandic cookery had become increasingly international in character. Many new ingredients had become available in Icelandic shops and it was easier to cook authentic foreign dishes and follow every modern culinary trend. Now almost any type of spice can be found in speciality shops, in addition to all kinds of vinegars and oils, oriental fish sauces, Mexican hot sauces and salsas, and so on. As elsewhere in the western world, extra-virgin olive oil, balsamic vinegar, sun-dried tomatoes, pine nuts, and black olives were among the key words to innumerable trendy recipes at the turn of the century. Arugula, so unknown when I published my first cookbook in 1998 that I had never seen it in a shop and had to explain to people what it was, almost seemed mandatory in every dish just five years later. During the years of the Icelandic financial boom, 2004 to 2008, restaurant chefs and enthusiastic home cooks sometimes seemed to be competing with each other in creating exotic dishes from expensive ingredients, often flown half way around the globe. In the meat freezer at a Reykjavík supermarket, you could find venison from New Zealand, ostrich and antilope steaks from South Africa, Kobe beef from Japan, kangaroo from Australia, and other delicacies from far flung places. The price didn’t seem to matter. Dishes decorated with gold leaf became in a way symbolic of the bubble, especially after it burst in October 2008 and plunged Iceland into a deep financial crisis. At the same time however, interest in Icelandic resources and local food began to increase. Local game has become popular, quick-fried cormorant, guillemot, and puffin breasts appear on restaurant menus and many restaurants serve simple but delicious fish dishes. New methods are used, or old methods revived to cook with traditional Icelandic ingredients, sometimes mixing them with exotic vegetables, fruits, and spices. At home, lamb no longer reigns supreme, having been replaced by chicken. People now eat less haddock, which means less fish consumption in general, because even though several other types of fish enjoy some popularity, they have never really managed to replace haddock it in the Icelandic hearts. Many young people seem to steer away from fish, except in the form of sushi, which is very popular. Desserts, formerly served every day or even twice daily, are now more or less confined to dinner parties and festive occasions, but coffee parties are still popular – and most Icelandic homemakers are still able to muster their cake-baking skills when needed. Interest in cooking has been on the increase in recent years and many food blogs have cropped up and enjoy popularity. Many cookbooks are published and cooking shows are popular, even though people probably cook less at home than ever. I have really enjoyed this history and using it in a research I’m doing for a book. Thank you for your effort. Hello Nanna! I really hope this is a contact field and I’m pressing the right buttons! Sandor Katz recommended I look at your site (and the English bit looks very well researched!) I talk on fermentation here in the UK (amongst other things like sushi, street food, training..) and also make weird contraptions for cooking over charcoal. I’m planning on burying a shark in Wales next Easter, then drying it and talking on fermentation (again) at The Good Life Festival in Hawarden next September. I’m really interested in the science behind Hakarl and am trying to get a film crew together to document it. This would involve me coming to Iceland, visiting the shark museum and hopefully yourself! And if sharks can be preserved this way what would it take to preserve meats in a similar manner? I dug a pit and buried cabbages in it for 4 months for this years festival which worked well. Hi, Mike, this sounds very interesting but it would be better if you contacted me by email at nanna@forlagid.is.